If ghee if not solidified, then refrigerate for some time. Take in a large deep plate, run in circular direction with a flat palm. Rub enough to make ghee white, fluffy and light. Sieve baking powder with flour. Add sugar to ghee and mix till light. Fold in sieved flour, almond powder till well mixed. Sprinkle some milk if dough seems too dry to hold. Mix with a light hand. Do not knead too much or make dough gooey. Coarse dough will make better and lighter cookies. Shape in small rounds, arrange on baking sheet. Preheat oven to 2000C, before putting in cookies. Press on almond bit on each cookie in centre. Bake at 1800C for 7-8 minutes or till very light golden. 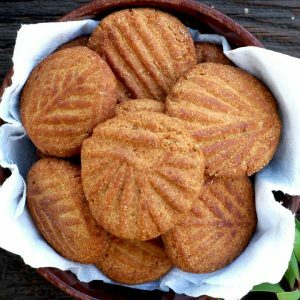 Feel free to comment or share your thoughts on this Almond Nankathai Recipe from Awesome Cuisine.